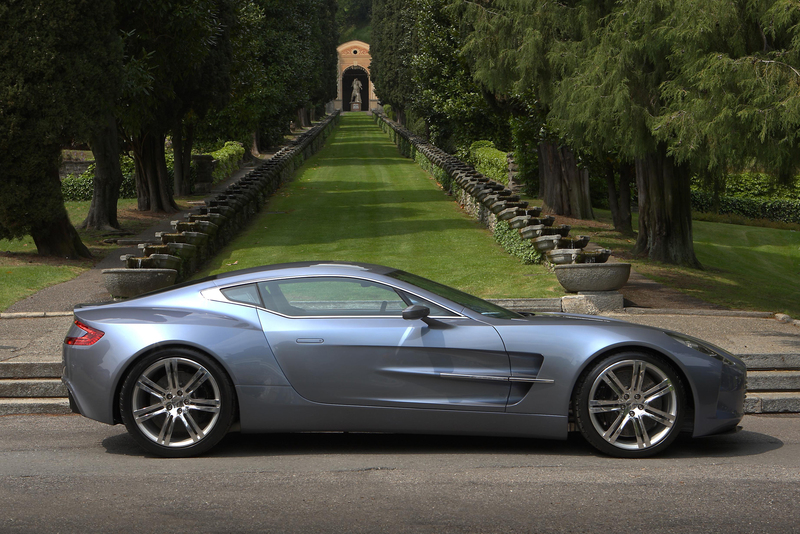 With an exhaust note to scare the tux off of James Bond, Aston Martin enters the world of supercars with the new One-77. 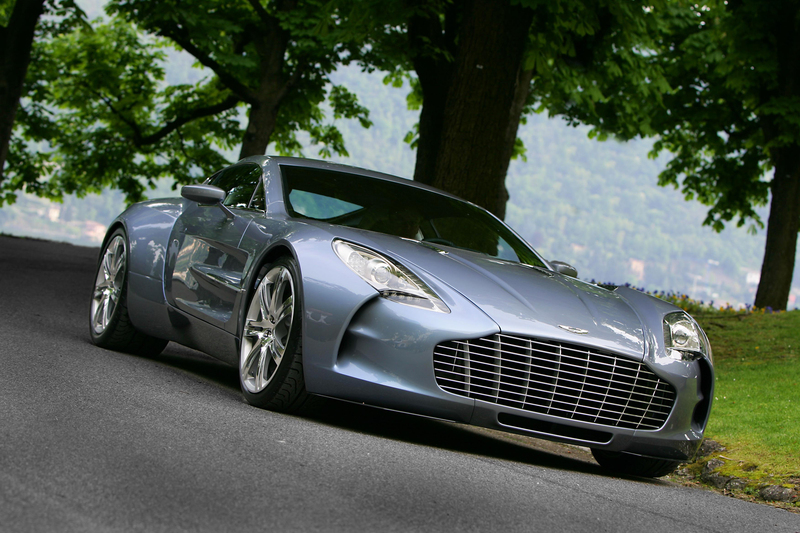 Hand built, the Aston Martin One-77 embodies the principals of Aston Martin, combining technology with craftsmanship. 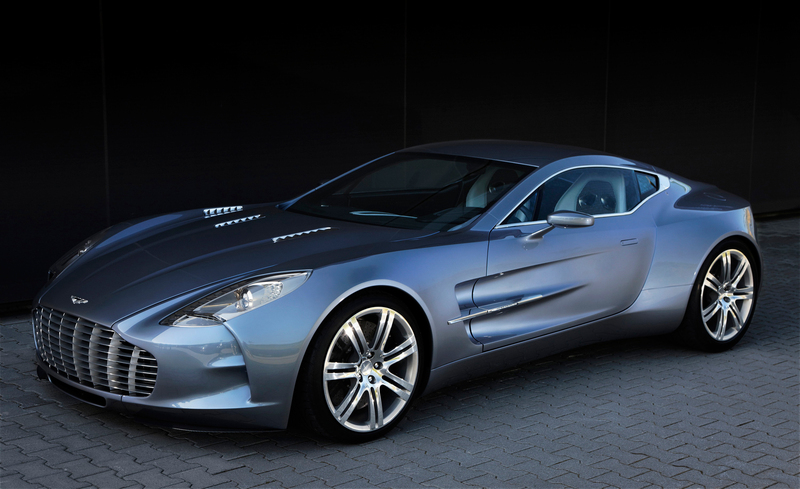 The Aston Martin One-77 has been designed to showcase the technological advancements and craftsmanship of Aston Martin. A wide body with large rear fenders, coupled with an imposing front grille flanked by two air vents creates a muscular and powerful appearance. 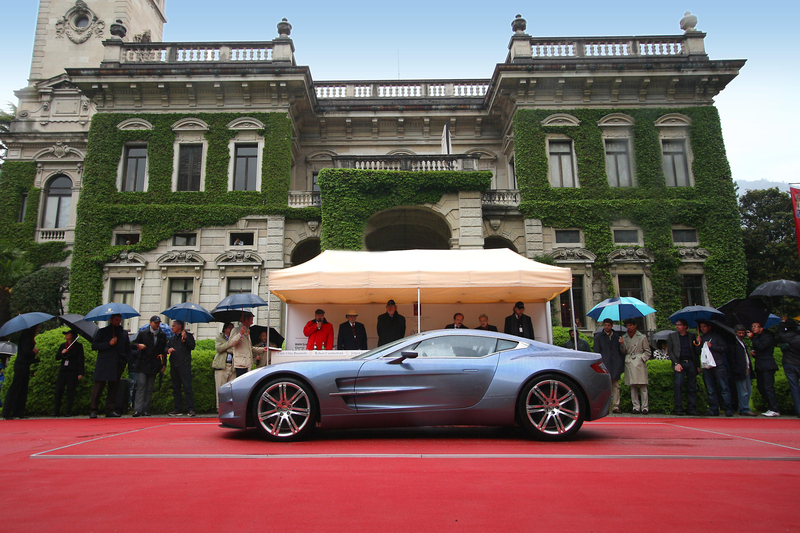 Aluminum panels are hand rolled demonstrating the attention to detail associated with Aston Martin. 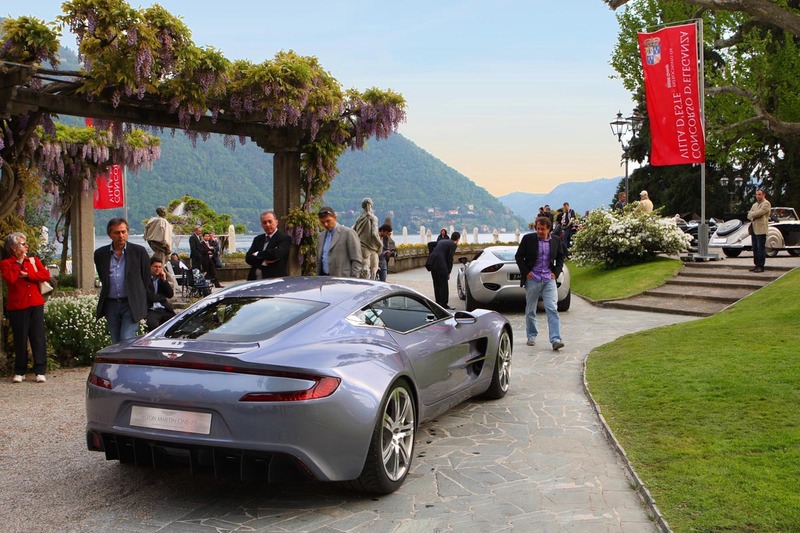 The Aston Martin One-77 features the signature Aston Martin C-shaped taillights, which connect to form a sleek and wide rear. 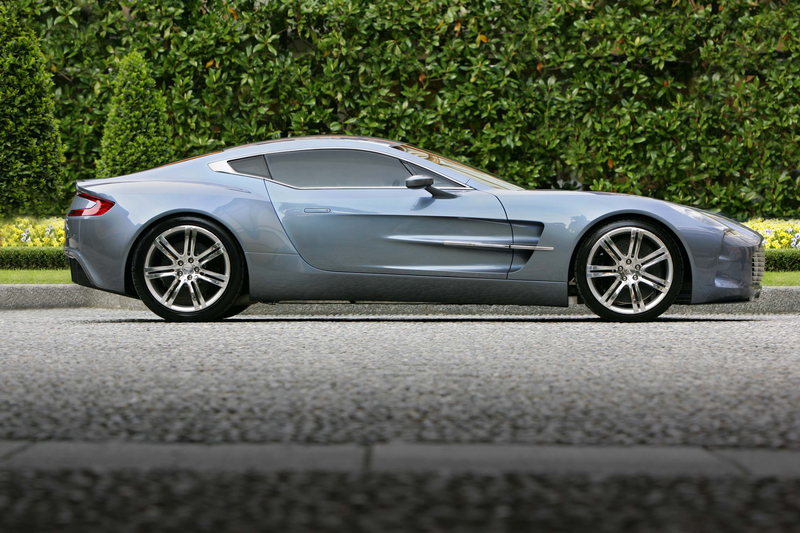 With a goal of creating a powerful engine from the 6.0-liter V-12 used in the DBS, DB9, and V-12 Vanquish models, Aston Martin partnered with Cosworth, the legendary engine builder. The result was a monstrous engine with approximately 750 bhp, and 553 lb-ft. of torque weighing 10 percent lighter, and displacing 7.3-liters. To protect the carbon fiber cam covers and inlet manifolds from exhaust heat engineers use 24-karat gold leaf. 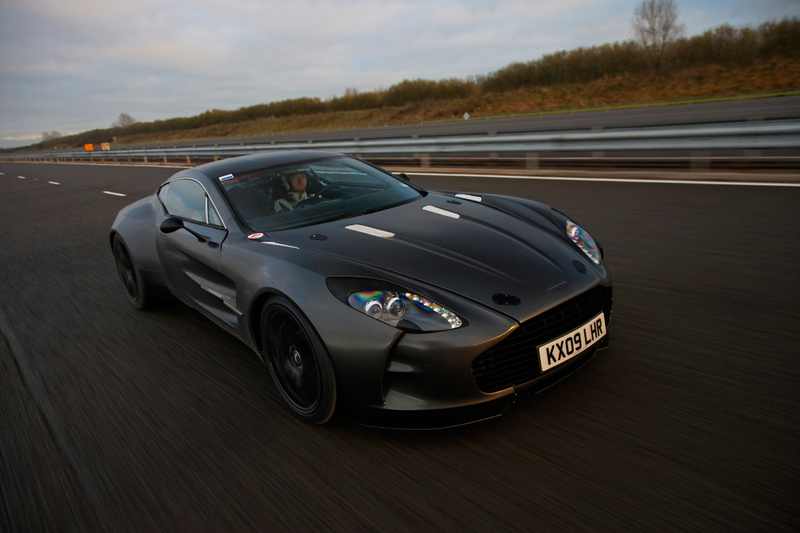 Using dry sump lubrication, the engine is mounted 3.9 inches lower than any road going Aston Martin sporting a V-12. 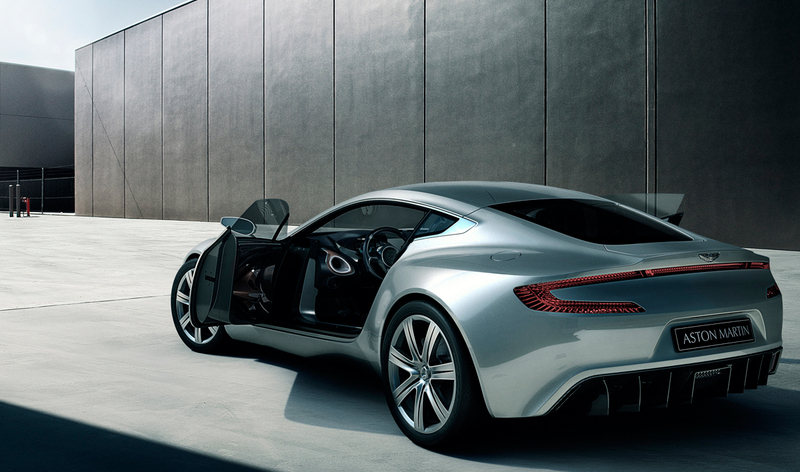 Giving the One-77 greater handling dynamics is a front mid-mounted engine, 10 inches behind the front wheel centerline. 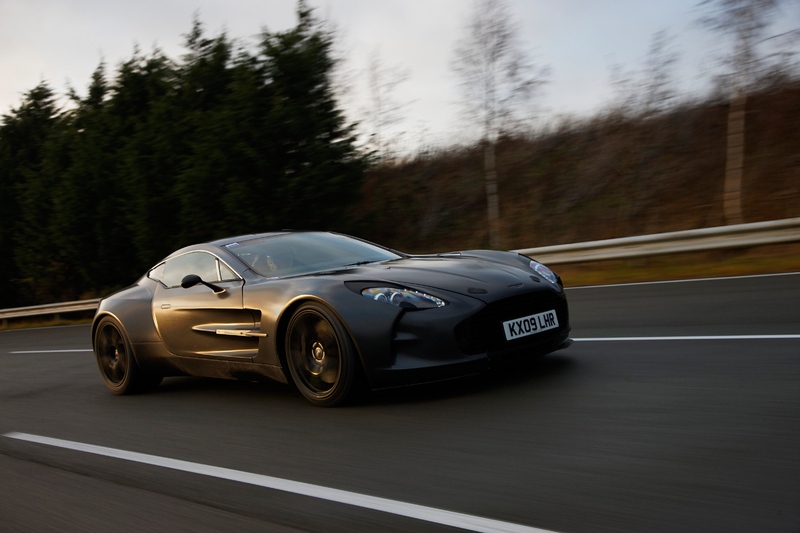 The Aston Martin team borrowed principals and technology from the DTM race series and applied them to the One-77, creating a technologically advanced supercar with impressive performance. 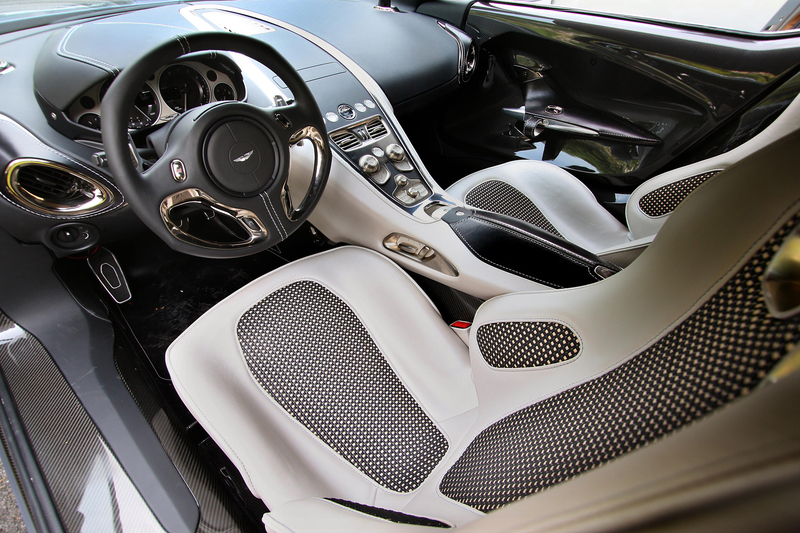 A carbon fiber tub was developed in conjunction with the leaders in carbon composite technology, Multimatic (MTC), to create a rigid and lightweight structural core. 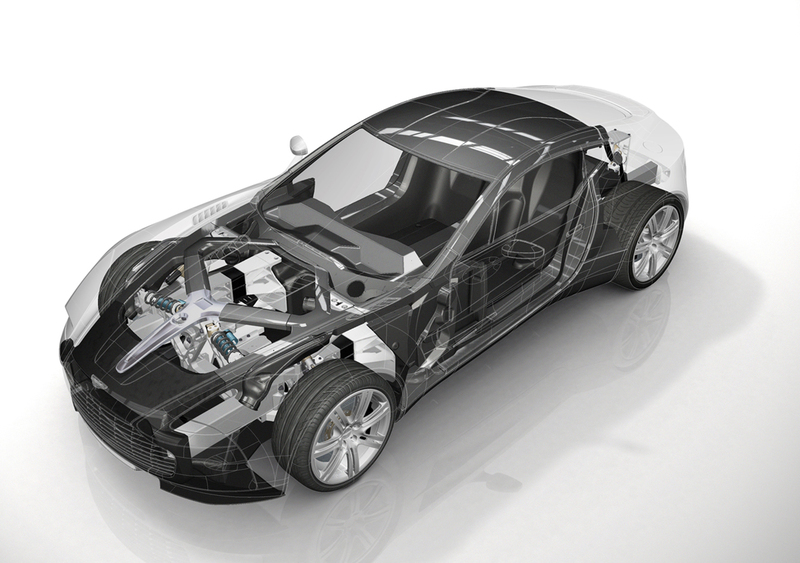 To further shed weight and create better handling dynamics The One-77 employs an inboard suspension setup similar to that of a racecar. For the first time in a road going car, fully adjustable dampers are available with advanced Dynamic Suspension Spool Valve technology. 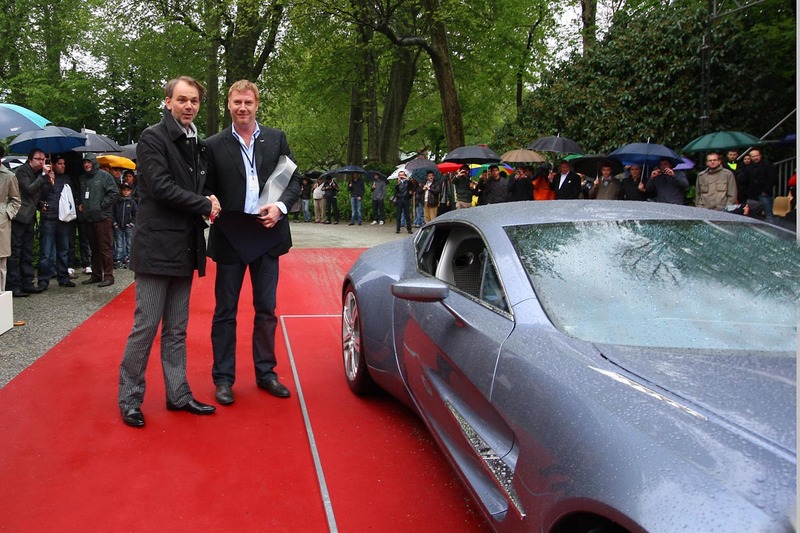 Aston Martin engineers will tune the suspension to tailor to the needs of the owner upon delivery. 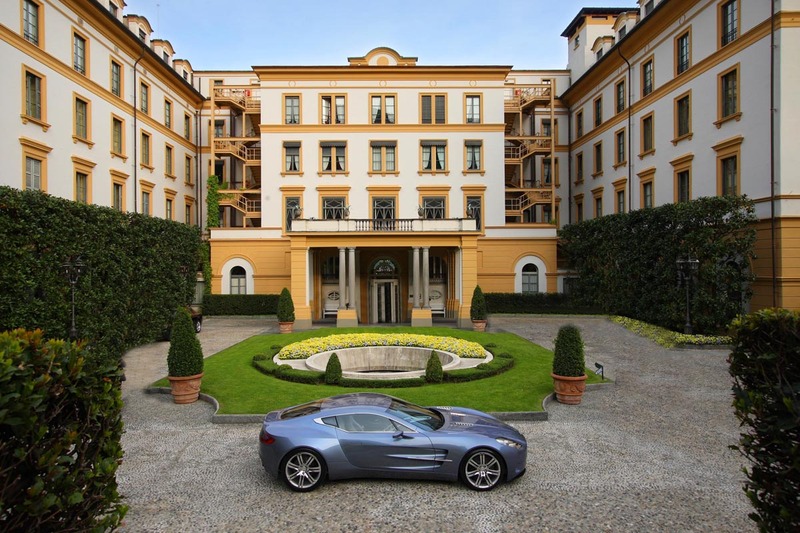 A new six-speed robotized manual gearbox has been developed for the One-77 and is rear mid-mounted to help achieve a weight distribution of 49:51. Due to the immense power delivered from the engine, the transmission’s internals had to be strengthened. 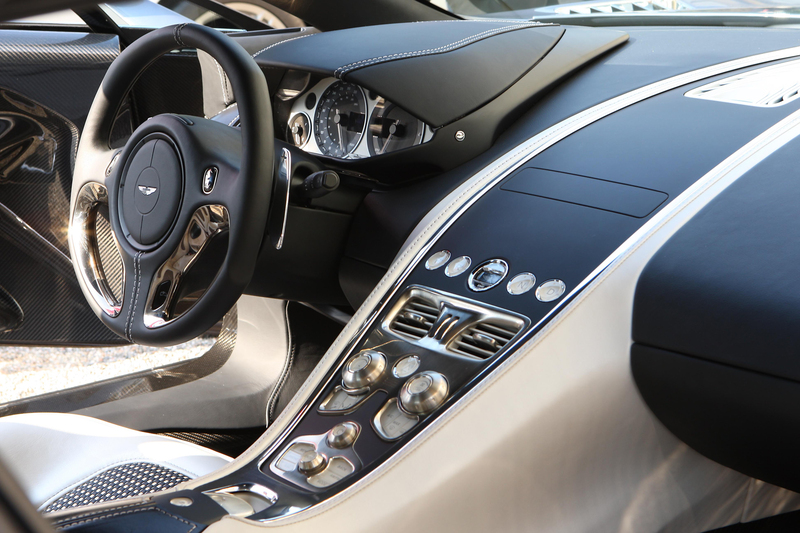 Gearshifts will be controlled using two column-mounted paddles placed behind the steering wheel. 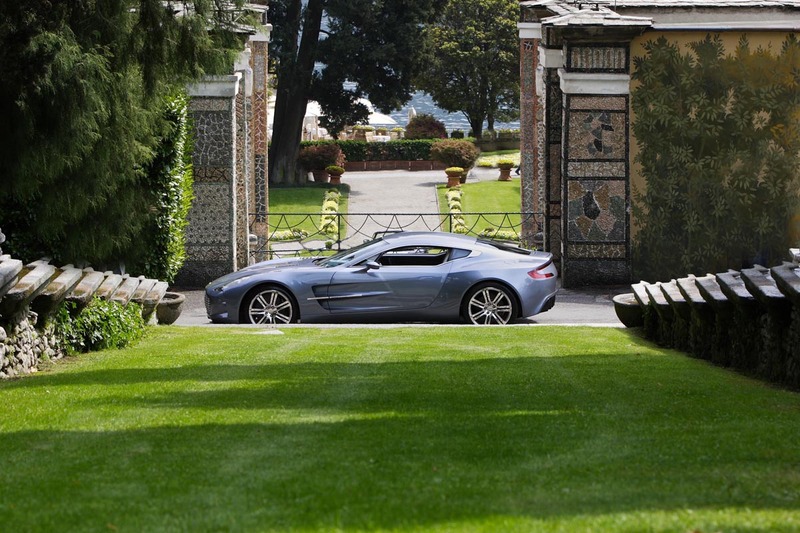 Twenty-inch front and rear wheels featuring Pirelli P Zero Corsa tires are standard on the One-77. Lightweight vented carbon ceramic brakes are used to further reduce weight to approximately 3300 lbs. 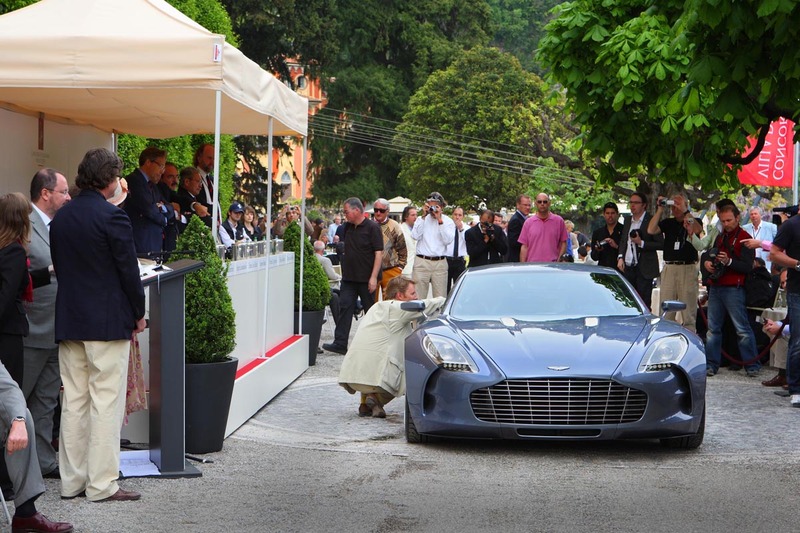 Aston Martin is currently accepting orders through the global network of dealerships at a price of £1,020,000. 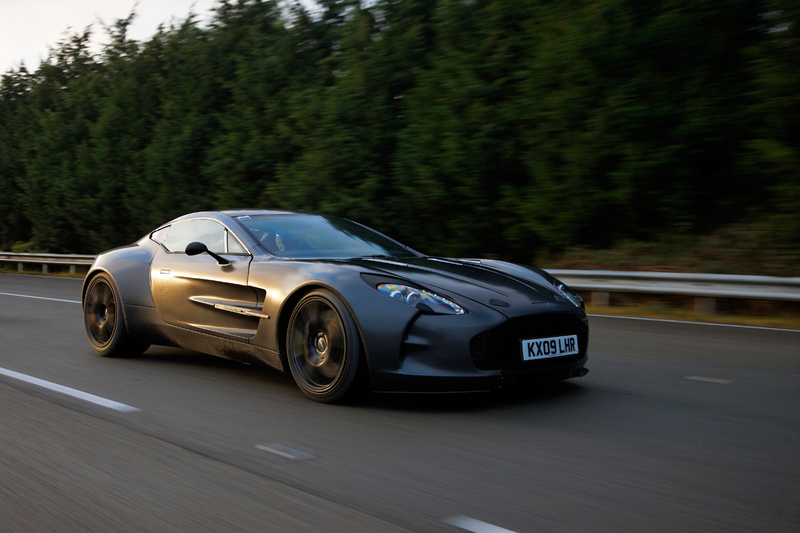 Is the Aston Martin One-77 the most extreme Aston Martin ever?